WTI Crude Oil Price Prediction 2016: Where Will the Market Go from Here? Subject: WTI Crude Oil Price Prediction 2016: Where Will the Market Go from Here? × 1 = 9 Required Please enter the correct value. WTI Crude Oil Price Prediction 2016: Oil prices are now on pace for their worst year since the Great Recession. 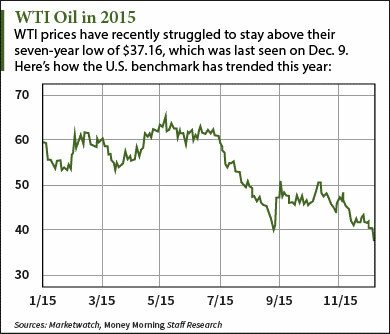 WTI and Brent crude oil prices are down 38.7% and 39.9% in 2015, respectively. One of the worst days of the year for oil prices was "Black Monday." On Aug. 24, WTI and Brent closed at $38.24 and $42.69, respectively. Oil prices fell after the Dow Jones Industrial Average plunged 1,089 points at the opening bell. That day saw the largest intraday point loss ever for the Dow Jones. Since then, oil prices have remained at their lowest levels since February 2009. As of Dec. 10, WTI crude oil prices currently sit at $36.74 a barrel. Meanwhile, Brent crude oil prices trade at $40.07. A confluence of bearish factors caused the oil price crash in 2015. These include supply levels at 80-year highs, weakened Chinese commodities demand, and OPEC's high daily production quota of more than 10 million barrels. Although oil prices will endure short-term volatility, they will stabilize and move higher over the long term. One reason why oil prices will rebound in 2016 is the high number of mergers and acquisitions. You see, the current low price environment is ushering in a wave of M&A activity that will stabilize the oil sector by making it leaner and more consolidated. This will lower the number of U.S. producers and birth a new group of heavyweight companies that will strengthen prices. "The specific objective of M&A may vary from deal to deal, but the overall goal remains the same: to streamline participation in advance of sector stabilization and the inevitable rise in raw material prices," explained Money Morning Global Energy Strategist Dr. Kent Moors in September. On April 8, Royal Dutch Shell Plc. (NYSE ADR: RDS.A) acquired BG Group Plc. (OTCMKTS ADR: BRGYY) for $70 billion. The deal is the largest energy merger in more than a decade and will create the world's largest producer of liquefied natural gas. "The Shell-BG [transaction] is the first clear megamerger option crossing the oil-gas division," Moors noted back in April. "We will see more of these as the new energy balance among a widening number of energy sources kicks in." Another huge merger just happened in late August. Schlumberger Ltd. (NYSE: SLB) – the biggest oil field services (OFS) company in the world – bought competitor Cameron International Corp. (NYSE: CAM) in a $12.74 billion deal. It's the second-largest OFS merger since Halliburton Co.'s (NYSE: HAL) $34.6 million buyout of Baker Hughes Inc. (NYSE: BHI). But the most important – and fundamental – reason why oil will rebound is that demand will outpace supply in 2016. That's because there will be a huge drop-off in well production next year. You see, the average oil well produces most of its volume within the first 18 months it is online. The majority of U.S. oil wells are now starting to see a drop off in production. That makes sense considering the oil price crash has been going on for about 18 months. "The U.S. rig count has declined precipitously… that can't help but lead to a drop in supply, especially when it comes to shale or tight oil," Moors said. "It's called the decline curve and can't be finessed forever." Supply reports already reflect the decline. According to the U.S. Energy Information Administration (EIA), U.S. production in September decreased by 120,000 barrels from August. The EIA expects monthly output to keep falling through at least mid-2016. The International Energy Agency (IEA) places global demand at 95.6 million barrels a day next year. That's up from a projected average of 94.2 million this year. "Supply won't be able to keep up with rising demand," Moors said in September. "The fundamentals paint a picture of tightening oil supply at a time of increasing demand." Oil prices in 2016 will follow what Moors refers to as a "ratcheting" pattern. That means prices will endure short-term volatility yet maintain an overall upward trajectory. Because oil is priced in U.S. dollars, many short-term factors can depress prices. These include rate hike teases and the dollar's strength. Both of these influences can cause knee-jerk downward movement in prices. But both Brent and WTI crude oil prices will gradually rise over time thanks to growing demand and shrinking supply. "One thing is clear," Moors explained. "The ratcheting effect I have been talking about – in which oil has an overall trajectory in one direction (in this case up) despite volatility in the other – is taking shape."